Imanpour Namin, J., Nami, E., Heidary, S. (2014). Length-Weight Relationship and Fulton’s Condition Factor of Macrobrachium Nipponense (De Haan, 1849) in Southern Coasts of the Caspian Sea-Iran. International Journal of Advanced Biological and Biomedical Research, 2(5), 1650-1656. Javid Imanpour Namin; Elnaz Nami; Sanam Heidary. "Length-Weight Relationship and Fulton’s Condition Factor of Macrobrachium Nipponense (De Haan, 1849) in Southern Coasts of the Caspian Sea-Iran". 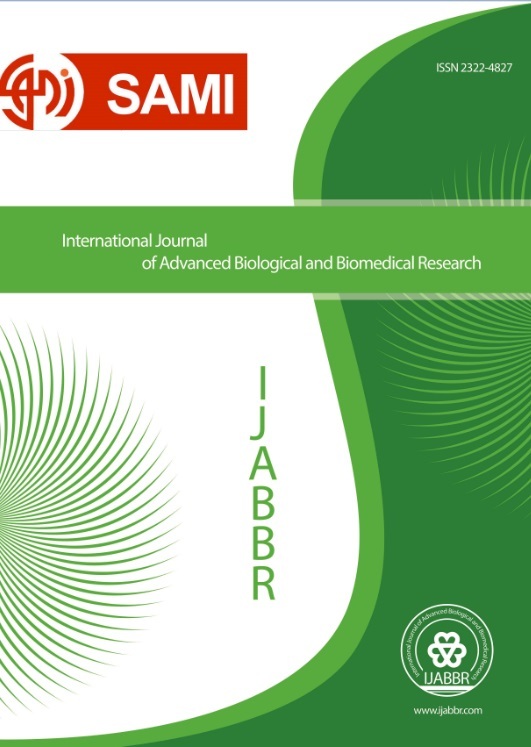 International Journal of Advanced Biological and Biomedical Research, 2, 5, 2014, 1650-1656. Imanpour Namin, J., Nami, E., Heidary, S. (2014). 'Length-Weight Relationship and Fulton’s Condition Factor of Macrobrachium Nipponense (De Haan, 1849) in Southern Coasts of the Caspian Sea-Iran', International Journal of Advanced Biological and Biomedical Research, 2(5), pp. 1650-1656. Imanpour Namin, J., Nami, E., Heidary, S. Length-Weight Relationship and Fulton’s Condition Factor of Macrobrachium Nipponense (De Haan, 1849) in Southern Coasts of the Caspian Sea-Iran. International Journal of Advanced Biological and Biomedical Research, 2014; 2(5): 1650-1656. The Length-Weight Relationship (LWR) and condition factors (CF) of 180 the oriental river prawn Macrobrachium nipponense collected from southern coasts of the Caspian Sea from May through September 2012 were studied. Shrimp samples were taken and immediately transferred to the laboratory of fish biology at University of Guilan for further analyses. Length, weight and other external features of all specimens were measured. The Total length and body weight of M. nipponense ranged from 1.58- 8.8cm and 0.41- 6.27gr respectively. A strong positive relationship was observed between the shrimp length and weight in both sexes (r= 0.81). There were significant differences in the condition factors of males and females (p<0.05). The lowest CF value was observed in June (CF= 0.89± 0.03) and the highest in July (CF= 1.90± 0.33). In this study the regression coefficient (b) was lower than 3.0 for males, females and combined sexes which was reflecting allometric growth of the M. nipponense.